You are at:Home»Customization»What Are the Odds? In April of 2012 I reached out via good-old Facebook to Stephen Miles after seeing posts of his insane paint jobs on several super high-end RC boats. Little did I know, three and a half years later Miles would have caught the attention of several high-profile performance boaters and become the go-to painter for Outerlimits Offshore Powerboats. Just this year alone his expanding family-focused company, Stephen Miles Design (SMD) in Owensboro, Ky., has been responsible for the graphics on several new Outerlimits, models, including Burton Kirsten’s Outerlimits SC 39 catamaran and Vinnie Diorio’s Outerlimits SL 41 V-bottom, not to mention Jeff Ford’s 2008 RPM Powerboats 26 Redline catamaran. 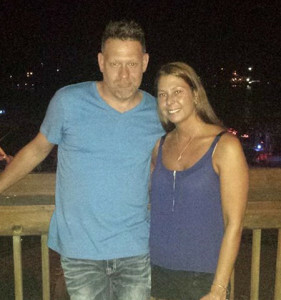 To say he, his wife and business partner, Heather, his brother-in-law, Tristan Gibson, and his fellow painter/righthand man, Steve Boarman, have been busy would be understatement. Kirsten’s all-carbon 39-foot canopied pleasure catamaran from the Rhode Island boat builder is Miles’ favorite design to date, but that probably won’t last long as he has a half-dozen more Outerlimits coming his way in the near future. Pretty incredible for a 42-year-old who not that long ago was airbrushing T-shirts. While progressing from T-shirts into custom motorcycles and RC boats and anything else he could get his hands on, Miles’ life was altered when Dan Hofman of Bonzi Sports, a well-known custom RC boat builder, reached out to him about six years ago. It wasn’t full-scale powerboat painting, but for the powerboat enthusiast who once owned a 27-foot Fountain Powerboats V-bottom, it was the stepping stone to a dream that came true when he got to design and paint Buddy Thomas’ Outerlimits SC 46 catamaran after being contacted by another soon-to-be SC 46 owner, Joel Begin, who had been following Miles’ work via Facebook and wanted Miles to paint Outerlimits’ second 46-foot cat. “My wife didn’t at all understand my excitement when I connected with Bonzi,” Miles told me in 2012. 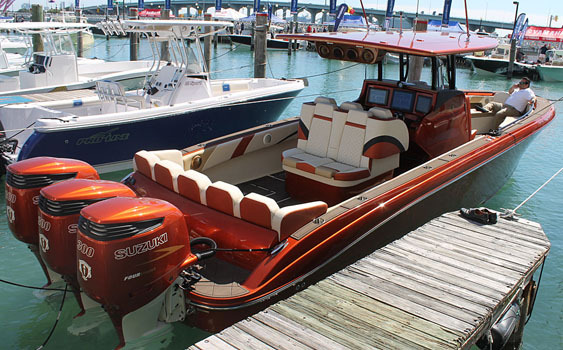 “But with me being as passionate about powerboats as I am, here was a canvas that was small enough to manage yet large enough to perform any amount of detail the customer wanted and was willing to pay for. Just like in full-scale powerboating, it’s safe to say that you can’t have a toy that cool without some nice custom paint. Miles said he’s pretty much phased out the RC boat painting part of his business to dedicate his time to serving Outerlimits properly. 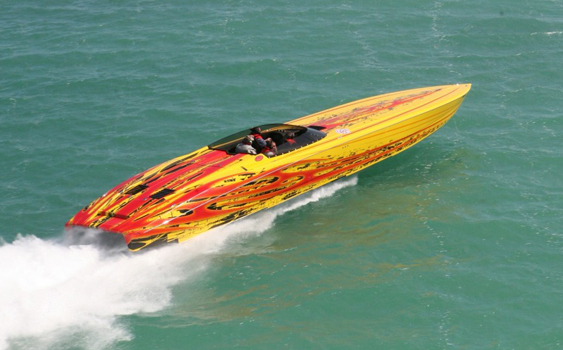 Of course, he will paint used boats when he has the time as evident with Ford’s 26-foot RPM. Ford, who found out about Miles on Facebook and knew he wanted “that guy” to paint his boat when and if he ever repainted it, made the call earlier this year and was blown away by the boat’s fresh look (read the story). “Stephen and his crew really knocked it out of the park; it was truly an amazing transformation,” said Ford, who added that the late RPM owner Steve Tripp would have been proud of the updated look of the boat. 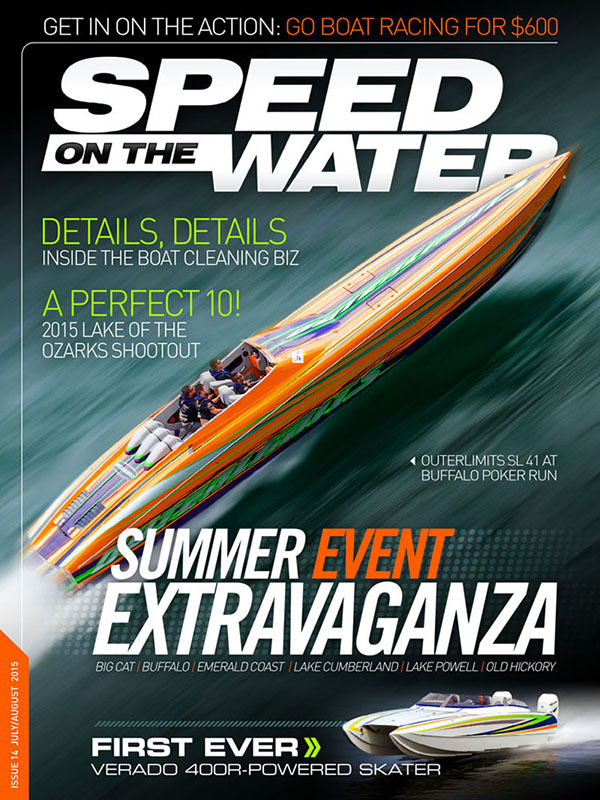 Vinnie Diorio’s SL 41 Outerlimits featured on the cover of the latest Speed On The Water digital magazine was painted by Stephen Miles Design. 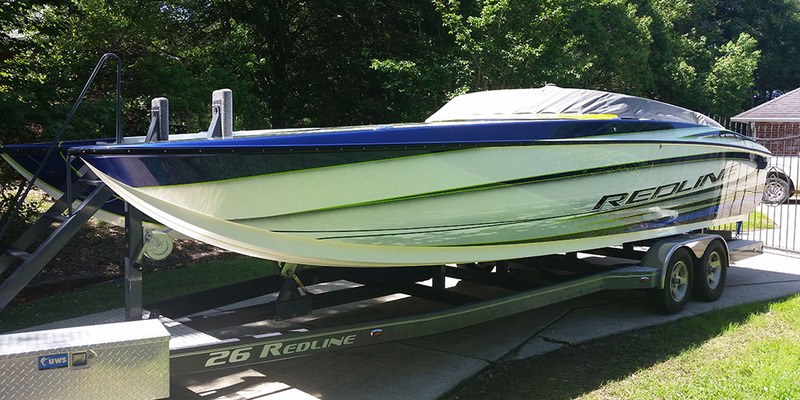 One of the paint shop’s upcoming projects is a makeover on a used boat—a 2004 Outerlimits 47 GTX that Kentucky boater Robert Goforth picked up in August. Goforth said he is excited about the paint design Miles came up with and can’t wait for the V-bottom to be handed over to Denny Kirkland of Custom Performance in Somerset, Ky., who will oversee the rest of the boat’s interior, cockpit and rigging updates. Look for a complete project series on speedonthewater.com. And according to Miles there’s even more to come, which makes it unlikely this will be my last story featuring his work.